It is a rare occasion when I fix supper but don’t eat with J. Awhile back I made these tacos, and I don’t recall if I ate before he got there or what happened, but I did not eat with him. I remember warning him that the salsa was excessively spicy (damn jalapenos! ), and I remember having to stifle my giggles as I watched the heat of it get to him. He’s pretty resistant to spicy food, but even he was having trouble with the salsa. I didn’t get a picture that time, so I decided to make it again – with a few modifications this time. The recipe itself isn’t flawed, but jalapenos are finicky little peppers and even when they look innocent, they can pack a major spicy punch. Well, that and I used two the first time when it said to use one. Oops. This time I only used one but it was still a bit hot, so I decided to add some creamy, cool Greek yogurt to the mix to cool it off a bit. That worked well. It still had a good spicy bite to it, but not too much. And, the ingredients for the sauce make a good bit more (like double) than you will need for just these tacos so either cut that in half (the avocado and Greek yogurt at least) or you can use the rest for something else. We used the remaining salsa on some beef, black bean, and avocado enchiladas that I made that same week. So good!! Heat a skillet over medium heat. Place the onion, jalapeno, garlic, and tomatillos in the pan. Cook for about 2-3 minutes or until nicely browned on the bottom, then flip and continue to cook until tender, a few more minutes. Place everything into a food processor or blender. Add the avocado, Greek yogurt, cilantro, lime juice, and salt and pepper to taste. Blend until smooth and have a little taste. If it is too spicy for you, you can add additional Greek yogurt to cool it down, and lime juice to thin it out. Set aside while you cook the shrimp. While the veggies are cooking, toss the shrimp in a bowl along with the olive oil, chili powder, and salt to taste. Using the same pan as you roasted the veggies, cook the shrimp until translucent, 1-2 minutes per side. 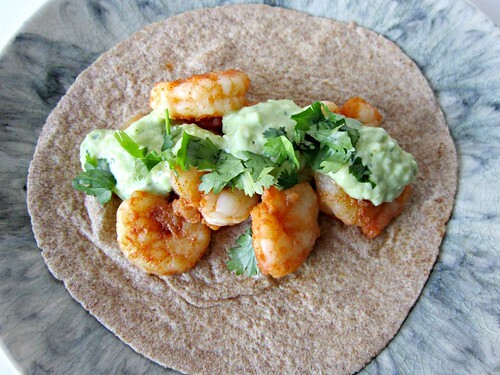 Warm the tortillas and top with a spoonful of salsa mixture, shrimp and cilantro. Serve with lime wedges.